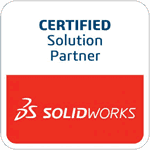 Springville, CA, April 15, 2010 – TEDCF Publishing, a leading publisher of interactive courses for SolidWorks and Autodesk Inventor, today announced the availability of SolidWorks 2010: Professional Modeling. Professional Modeling 2010 is designed for anyone who wants to learn effective was of using SolidWorks. It starts with the basics and gradually builds a strong foundation of skills. Each step of the way you learn strategies that maximize the use of the commands, and it has tips and techniques that will increase your productivity. This unique training course was written and produced by David Melvin, PE, a licensed Mechanical Engineer with over 23 years of experience in product research and development. His teaching philosophy is centered on the efficient use of the software. Since the core purpose of 3D CAD is to increase your productivity, David focuses on showing you how to apply techniques and sound processes that maximize your productivity and the quality of your work. The Professional Modeling 2010 course meets this goal by showing you effective methods and techniques used to create professionally constructed models. You start with the basics and progressively build a strong understanding of how the commands work as well as how to use them effectively. When you finish the course it becomes a helpful reference tool. The course comes with a search engine call the Memory Jogger. Type a keyword phrase, just like surfing the Internet, and then select lessons from your search results. Study sessions are also automatically controlled by the Lesson Player. It tracks your progress and opens on the last lesson you were watching. You can easily review lessons you’ve already watched, and you can search for the lessons you need. All you need is a Windows based computer with speakers. Click here to learn more about SolidWorks 2010: Professional Modeling and watch sample lessons from the course.